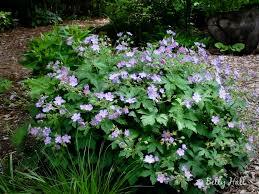 Wild Geranium is classified as a large perennial. The wild geranium, Geranium maculatum, is a perennial plant native to North America. It grows flowers in early spring and summer. The leaves are lobed with five or seven lobes and are relatively wide. Two to five flowers are loosely clustered at the end of the branches and are approximately 2.5-4cm in diameter with five petals. They come in a variety of colors from rose-purple, pale violet, pink, and sometimes white. The Wild Geranium prefers rich, acidic soils with a lot of moisture and can survive in a variety of environmental conditions. The blooms can range from purple to red and blue or white. Many people love collecting this plant in the springtime, and they cut it fresh and place it into salads, eat it raw or cook it down. This plant can be called a vine, perennial, wildflower or groundcover. It is a fast grower and can add color to your garden or yard quickly. 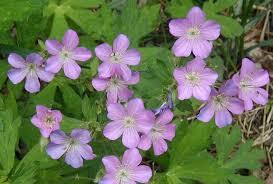 Wild Geranium is large and can reach heights of up to 3 feet at full maturity. This plant has a blooming time of early summer to late spring and can last about a month before they will fall off. The Wild Geranium can have a longer bloom time if the dead blooms are taken off once they are seen so that the rest can get the nutrients it needs. The wild geranium is known for its colorful flowers and blossoms. This plant can be both grown indoors and outdoors. If you're looking to add some color and life to your garden be it a fern, shade or woodlands type garden, then the Wild Geranium just might be the plant for you. Wild Geranium is versatile and easy to grow. It is an excellent plant for a beginner. Wild Geranium comes in different shades of the color purple with the added benefit of medicinal use for those of the homeopathic persuasion. Ancient Indians used its astringent properties to aid with ulcers, hemorrhoids, toothaches, and digestive issues. Wild Geranium is a reliable plant for its minimal growing conditions which include a medium amount of water with partial or full shade. 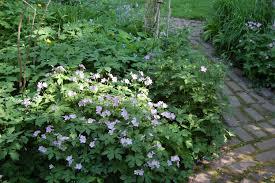 Wild Geranium can even flourish in full sunlight as long as the soil is slightly damp. The avid animal lover will enjoy the variety of creatures this plant attracts from the bumblebees to the Mourning Doves and white-tail deer. Beautiful plants like these can be shipped to your lovely garden in their bare root form in quality conditions.